If you currently rely on reading glasses, you’re likely well aware of the many inconveniences of presbyopia. This age-related condition usually starts to show up in your 40’s and makes it hard to see objects up close—especially in dim lighting conditions. Unfortunately, presbyopia is unavoidable. Everyone gets it—even people who’ve never worn glasses or contact lenses. But, thanks to new technology, there are alternatives to reading glasses—even for people who don’t want to undergo a surgical procedure. Presbyopia is caused by changes to the lens inside the eye. As people age, the lens gets thicker, harder and less flexible, making it more difficult for the eye to adjust or “accommodate” to images at varying distances. The process of accommodation in the human eye is similar to the “auto focus” feature on a camera. Just as a camera lens needs to be moved back and forth to focus clearly on the object being photographed, the lens of the eye adjusts its power to focus on things up close or in the distance. As presbyopia starts to develop, the lens becomes a “fixed-focus” lens, losing its ability to “auto-focus” on things at different distances. The result is clear vision at only one particular distance. Most people over age 45 have presbyopia. If vision for close up is more focused, a presbyope’s distance vision will be blurred. The reverse also holds true. If vision is more focused for distance, seeing things close up becomes a challenge. For this reason, when presbyopia begins, people will squint or hold reading materials as far away as possible to help their eyes focus. 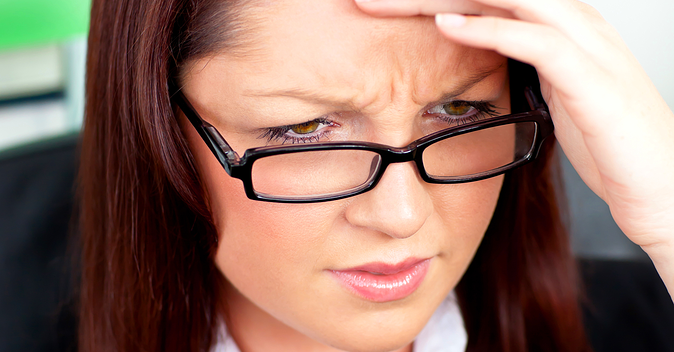 Eye strain, headache and fatigue are also common in people who have untreated presbyopia. The knee-jerk response to this change in vision is a quick trip to the drug store for a pair of reading glasses. For those people who currently wear contact lenses, reading glasses can suddenly bring near objects into focus. The problem, of course, is that you need to take them on and off throughout the day, which can be a real hassle—particularly if you can’t see you’re smart phone. If you wear regular single-vision glasses, switching between these and a pair of reading glasses can be even more cumbersome. If you don’t want to rely on readers, your options include wearing special glasses all the time, wearing contact lenses or, in some cases, undergoing surgery. Glasses for presbyopia are called progressives or bifocals. Progressive glasses are spectacle lenses with multiple powers in them to help you see at all distances. With respect to surgical options, these are somewhat limited since procedures for presbyopia have only recently been FDA approved. Contact lens options, on the other hand, are plentiful. To begin, there are three types of contact lenses you can choose from—soft lenses, hard lenses and hybrid lenses. Your other choice relates to the approach your doctor will take to help you see both far away and near objects. Choices include monovision fitting, bifocal lenses or progressive style lenses. Monovision contact lenses have only one power. To help you see at different distances, one eye is treated to help you see far away, while the other is treated for seeing up close. The brain learns to favor one eye over the other for different tasks. Progressive or multifocal contact lenses are contacts with multiple powers in them to help you see up close, far away and everywhere in between. Your doctor will help you decide which approach is best for your individual needs. If you decide that freedom from glasses is important to you and you want the ultimate in presbyopia correction, talk to your doctor about SynergEyes lenses. SynergEyes offers a progressive multifocal contact lens called Duette Progressive. These lenses work much like progressive glasses. The lens has a range of powers from near to distance to enable you to see up close, far away and everywhere in between. But, unlike progressive glasses, multifocal contact lenses do not require you to tilt your head to find the right spot in the lens for seeing at different distances. The power in the lens gradually changes from near to distance to provide natural vision at all distances. Another remarkable feature of Duette Progressive is its hybrid design. The development of hybrid lenses marks one of the greatest advances in contact lens technology because these lenses provide the best of two worlds—the optical quality that you can usually only get from a rigid, gas permeable (GP) lens and the comfort you’d enjoy with a soft lens designs. Duette Progressive lenses can even be worn by patients who have astigmatism—in fact, this is where these types of lenses truly excel. If you’re ready to kiss your readers goodbye, and want uncompromising vision, Duette Progressive may be just what you’ve been looking for.